View o Baden-Baden frae Moont Merkur. 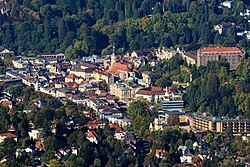 Baden-Baden is a spa toun, locatit in the state o Baden-Württemberg in soothwastren Germany. It lies at the northwastren border o the Black Forest moontain range on the smaw river Oos, juist 10 km (6 mi) east o the Rhine, the border line tae Fraunce, an aboot 40 km (25 mi) north-east o Strasbourg, Fraunce. This page wis last eeditit on 29 Mairch 2017, at 04:24.